FRISCO ” A typical day started with milking the cows and then delivering the milk after breakfast. Buckets of water had to be carried to the house and the toilet was outside, Harold Rutherford said into a microphone. 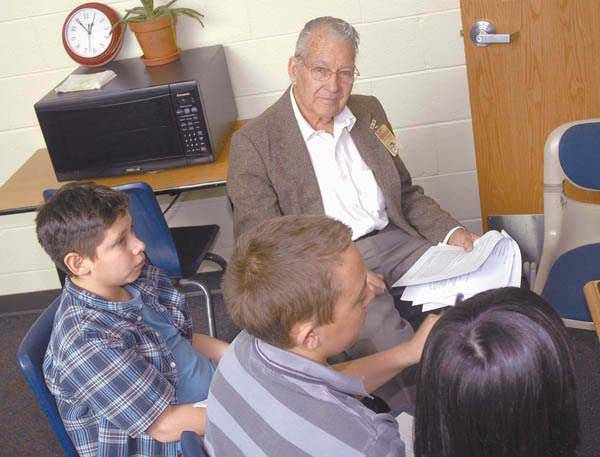 He sat near a computer with middle schoolers John Melott, Joseph Fitzgerald and Joel Delgado. As the students asked this Frisco historian questions about what life was like in the 30s and 40s in Frisco, they recorded the oral history. It was part of a partnership project between Therese McGraw’s Summit Middle School class and the Frisco Historic Park and Museum. The 10-student class split into three groups to interview Rutherford, of Denver, and Judy Anderson and Tom Randolph, of Frisco. “By the end of today, we’ll have oral history captured live,” said Julie Fishman, International Baccalaureate Middle Years program and REACH coordinator at SMS. Currently, at the museum there is a collection of oral history, said Simone Belz, director of the historic park and museum. And because the museum was looking for volunteers to help add to the collection, she thought middle school students might be interested in preserving some local history. So, the students researched a method and downloaded the technology used to tape the stories. Also, they used a variety of skills they were working on such as interviewing and letter writing to make the project happen. “We’re trying to hit as many skills as possible,” said McGraw, the students’ teacher, adding the project touched on reading, language arts, humanities and history. Rutherford was 11 years old when his family moved to Frisco in 1935, where he lived until he joined the US Navy in 1943. For him, living on the more than 150-acre ranch that included the area where Wal-Mart sits today “was just paradise,” he said. In fact, Rutherford wrote a book about life in Frisco called “Dustbowl to Paradise” and he recently finished a second book called “Dust, Wind and Tears” that includes 32 people’s stories about life on the great plains in the 20s, 30s and 40s. Rutherford loved riding throughout the area on a horse and enjoyed fishing and skiing to school. He told the three middle schoolers about the first car he bought when he was just a few years older than they are now. It cost him $5, he said. He described to the students how he used snowshoes and branches to mark the trail he used to ski to school each day. And he told them about his fist paid job that he started when he was their age. He cut and stocked wood for his neighbors who paid 15 to 20 cents an hour. “I had quite a little business going,” said Rutherford who saved his money to buy a $98 cow for his family when he was 14 years old. The only person he didn’t charge was his school teacher because he “gave a lot of grief” to her, he said with a chuckle. He figured cutting wood for her would help pay for his pranks, he added.